As I’ve written before, I like to have some variety with our daily transpo photo — i.e. it does’t always have to be a bus or train and I’m all for auto-oriented photos if they’re original. 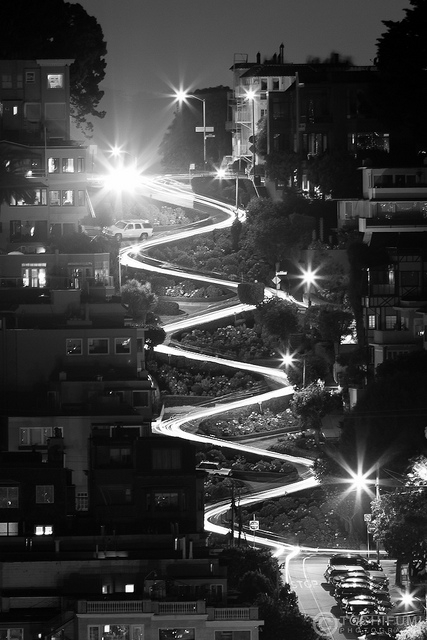 Thus, today’s very cool photo of San Francisco’s infamous Lombard Street, taken from the Colt Tower parking lot. Toshifumi used a Canon 7D with a 400mm lens and exposed the image with a 52 second shutter speed, f/14 aperture and 100 ISO. It was originally a color photo and converted to black and white during processing.